Bamboozled September 18, 2017: Lawn mower explodes, but who is at fault? When engines don’t get oil, they fail. That goes not only for car engines, but for any engine. Lawn mowers, too. Bob Sukovich says he knows all about that, and maintaining proper oil levels is part how he keeps his Craftsman mower in tip-top shape. But on Aug. 14, the mower pretty much exploded, the Morris County man said. He’s been trying to get Craftsman and Sears, the retailer where he bought the mower, to take some responsibility. Along the way, he said, their customer service was miserable. The mower had always been reliable, Sukovich said, until the moment it wasn’t. While cutting the grass that morning, a “knocking noise” came from the mower, Sukovich said. Bob Sukovich points at the part of the lawnmower that he said exploded as he was mowing his lawn. Sukovich said he was fortunate. His one-year-old daughter, who often plays in the yard while he takes care of the lawn, was inside. She could have easily been injured by projectiles that came off the exploding mower, he said. He purchased the mower in 2015 from a Sears Hardware store in Roselle, but the store has since shut down. So he called the Sears customer service line for help. After being transferred around, Sukovich said, he eventually got to a manager from the Watchung store. “I was informed that the lawn mower was out of warranty and that they wouldn’t be doing anything for me,” he said. Sukovich wasn’t satisfied. Warranty or not, he said, what happened was a safety issue and should be addressed. Knowing an answer can sometimes be different when you get a different rep on the phone, he called again. This time, he got lost in the voicemail options. Changing strategies, he tried to contact Sears through a direct message on Facebook. “The person who I was talking to also indicated that the mower was out of warranty and that I would need to talk to Craftsman directly,” he said. Even if the mower was out of warranty, Sukovich said, he was concerned that no one at Sears seemed to show worry that someone could have been injured. Before trying Craftsman, Sukovich tried Sears again. This time he was transferred to what he believes was a third party insurance company that handles injury cases for Sears. The rep there said Sukovich was in the wrong place. Sukovich said he called the Sears customer service line four more times the next day, and again, he was told the warranty had ended. “[The rep] expressed concern over what had happened and advised me that I should make arrangements to bring the lawn mower in for repairs,” he said. When he explained that his local store had shut down, the rep suggested he bring it to a different location. He then tried Facebook again, tagging both companies on posts on his own page. He also posted a message on Craftsman’s page. He said Craftsman responded, instructing him to send an email. He did, but no one responded. Sears doesn’t allow consumers to post directly on its page, Sukovich said, so he added his comments in another post that Sears made. But Sears deleted the comments from the page, he said. Sukovich said he was equally frustrated by the company’s apparent lack of caring about the possibility of someone being injured and the lack of help to solve the mower problem. “At no time did I feel like I was valued as a consumer,” he said. We reviewed Sukovich’s story, and we looked to see if there was a history of problems with thse mowers. We couldn’t find anything specific about this model, so next, we reached out to the companies. Sears sold the Craftsman brand to Stanley Black & Decker in January 2017, so we gave Stanley a shout. No one responded to several requests. But Sears did respond, and quickly. Spokeswoman Dana Shoulders said based on Sukovich’s description, “it sounds like his mower threw a rod. This happens when the mower is operated on low, no, or dirty oil,” she said. She said sometimes the rod goes with enough force that it breaks the housing. It’s not considered a safety issue, she said, and even when there is a warranty, this wouldn’t be covered because it was caused by abuse or lack of maintenance. Bob Sukovich holds a piece of his lawn mower. Shoulders said she explained this to Sukovich, who she said insisted he did proper maintenance. If the repair shop determines it was a maintenance issue, at least Sukovich would have an estimate “and could decide how he wanted to proceed knowing that any further expenses would be his responsibility,” she said. 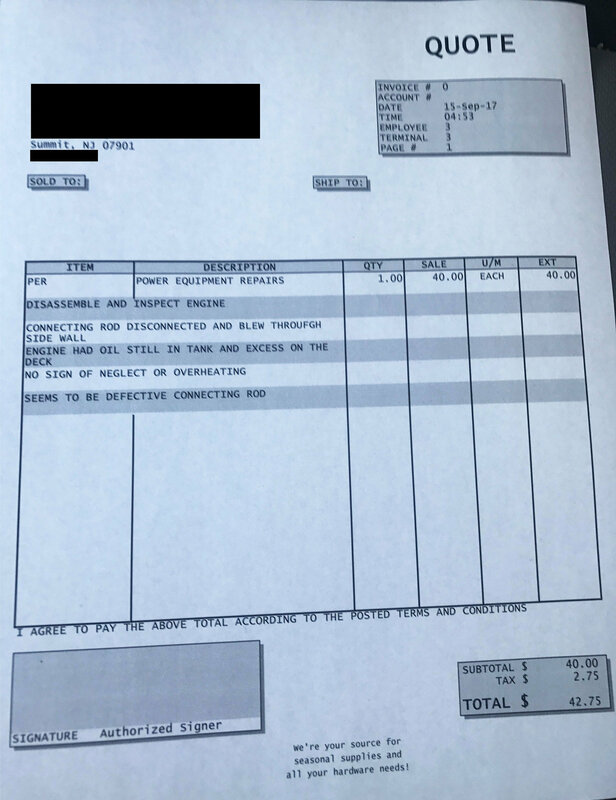 If the shop says the failure was instead caused by a defect, Shoulders said, Sears would evaluate and possibly cover all or part of the repair, or possibly send a gift card to use towards the purchase of a new mower. Sukovich disagreed vehemently with the possibility of it being a maintenance issue, saying he’s fully aware of the mower’s need for oil and that he has taken proper care of the unit. A few things happened before he could take the mower to a shop. First, Sukovich received an email from Craftsman saying it’s “escalated this issue to the appropriate party.” But he’s heard nothing further. Then he received an unexpected and unsolicited call from the U.S. Consumer Product Safety Commission. The investigator asked for details about the incident. We asked the CPSC for details, but it directed us to its website, which archives all complaints and safety incident reports after 2011. We couldn’t find anything specifically about this lawn mower, so for now, a bit of mystery remains. Sukovich took the mower to an engine repair shop, and he received the shop’s diagnosis late Friday. We sent the report to Sears, but we didn’t hear back in time for publication. In the meantime, Sukovich is using a weed whacker to keep his grass at bay. Next, he plans to borrow his father-in-law’s mower.